At age 72, Plácido Domingo continues to astonish. We have known him as a tenor in over 140 operatic roles, performed at the leading houses of the world. We know him as the general director of both the Washington National Opera, and the Los Angeles Opera. We also follow his wholly reputable career as conductor. It is time to consider Domingo as the baritone he is becoming. This is surely a mark of Domingo’s musical intelligence. He has always understood how to penetrate a role, and manage a career. Recently overcoming both colon cancer and a stroke, he has now released “Verdi”, a selection of 18 baritone arias on Sony Classical. His transition from tenor to baritone began several years ago. Although his first auditions, in Mexico in 1959, were as a baritone, he has made most of his spectacular career in the upper altitudes. But in 2009 he made his ‘debut’ as baritone, and it has been a steady ascent ever since. 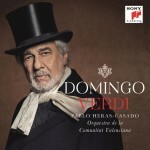 In this recording, we find Domingo the dramatist we have always known. His vibrato remains an ornament, and not a disease. His famous warmth translates to this new repertoire. Above all, we hear an unforced luminescence that has always been part of his signature. In these 18 arias, accompanied by Pablo Heras-Casado and the Orquestra de la Comunitat Valenciana, he surveys the best-known Verdi, from Macbeth to Forza, Ballo to Boccanegra, Trovatore to Traviata – and much more. It is a pleasantly difficult task to single out any of them. Surely, though, his realizations of Di Provenza and È questo will bring the warmest of smiles to all who know the roles, and who have followed the man. His work is beyond admirable. It is deeply informed, and gratifying. This new recording is strongly recommended to all who admire its singer, and as a starter kit for all who wish to discover the central Verdi baritone repertoire in the hands of one of our great musicians. We have, for 50 years now, been living in the Age of Domingo. This album opens a new era in that age. One small miracle follows another. 06 - Abbasso le spade! … Plebe! Patrizi! … Popolo dalla feroce storia! 15 - Che parli tu di morte? 18 - E s’altra prova rinvenir potessi?